[sd]Have you ever wanted to watch movies or TV shows online on your iPhone ? Well, there are very few iPhone apps and websites which are offering movies and TV shows online for free, and I think this is because of lack of flash support in iPhone. But if you are using a WiFi connection on your iPhone, there are few websites and apps which will allow you to watch free movies, TV shows and lots of other cool stuff related to videos. And the best part of these choices that they are totally offering a legal way to watch them online. So, in this article, I am compiling a list of 6 best apps and websites for iPhone that allows you to watch movies, TV shows or videos online for free. EndlessTV: A fantastic alternative to YouTube on your iOS device where you can subscribe channels and watch videos in succession. With the feature to skip to next video with a swipe, you will never get interrupted by an ad. Also, there is a ‘Sync’ button that can download all videos and you will be able to watch them anywhere without waiting for them to buffer or load. B-Movies :B-Movies is an free app to browse the Internet Archive’s Moving Images library of free movies, films, and videos. New version allows you to browse the movie archive through Edge/3G but you till need Wi-Fi connection to watch movies. The list of categories includes Animation, Technology, Movies, Religion, Sports and Vlogs. You can alse see the synopsis and ratings given by the viewers for every video in the list. You can alos bookmark your favorite videos, search the categories and also choose videos from Low, Medium and High Quality basis. Hollywood Pocket : This is another cool website which allows you to watch movies online although the collection is not big but surely ahead in terms of video quality. 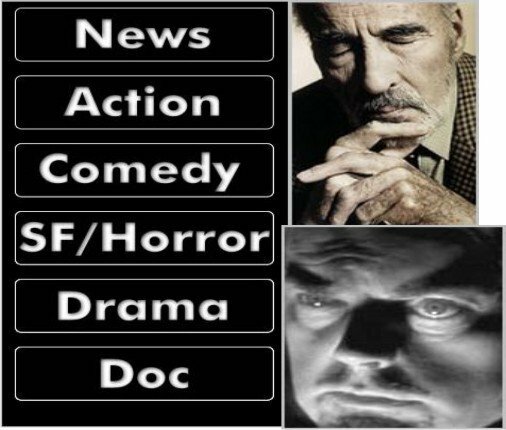 You have to visit the site from the iPhone Safari browser and choose the list of categories which contains News, Action, Comedy, Sci-Fi/Horror, Drama and Documentaries. You can pause, fast forward or rewind the movie as these movies are in Quicktime format. It has some good old movies collections in its categories. You will get the time details of Run Time of a video in front of the movie cover. Justin.tv : This is surely a gift for those who wanted to connect with latest news all around the globe. Justin.tv is the simplest live video service in the world using 3G or Wi-fi and watch every live and participate in the chat. You can also create live video and show anyone in the world. When you favorite video goes live, you will get push notifications on your iPhone. Joost : Another free iPhone application with a huge amount of videos available from categories like celebrity news and gossip, music videos, action sports, comedy and web originals. You have option to browse videos by category, popular video or the Joost pics. for films, documentaries and TV shows, with a huge variety from black and white Betty Boop cartoons to celebrity gossip, from Bridezilla episodes to extreme sports documentaries.You can browse videos by category, browse all the popular videos, or the Joost picks. The main categories of Joost are Film, Music and shows, which are further divided into movie genres like action , comedy, horror etc. But the sad part is film category is limited to clips, trailers and documentaries whereas video available under shows are countless. Spreety TV iPhone : There is a custom iPhone version of Spreety TV main site which allows you to access a limited categories to watch full episodes of TV shows online through 3G or Wi-Fi on your iPhone. To access the iPhone version of Spreety, you have to open your Safari browser and type iphone.spreety.com. You can see NBC, CBS, CW, clips and limited full episodes through Spreety TV on your iPhone. For the CBS iPhone shows, a Wi-Fi connection is recommended. There are few glitches as loading of a clips sometimes take time but work fine when you try it again after sometime later. But the full episodes streaming of some shows in high quality format makes Spreety TV mentioning here. Daily Motion : Daily Motion is the free app available in iTunes Apps store. Its basically a video sharing website that allows you to watch millions of videos from all around the world. It has a nifty feature in which you can share the videos which you like the most with your friends via email, Facebook and Twitter. 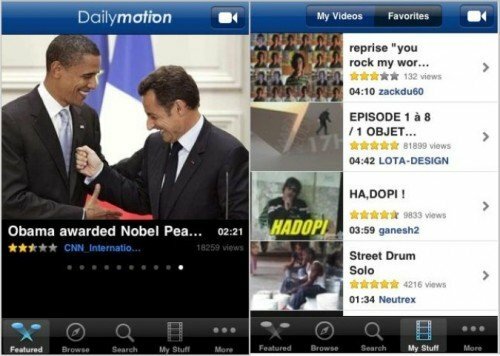 Daily Motion is a great app to watch short films, music videos, trailers, animation etc. You can also subscribe to 15 channels like News & Politics, Fun, Music, Film and rate videos or add video by signing up a free Daily Motion account. 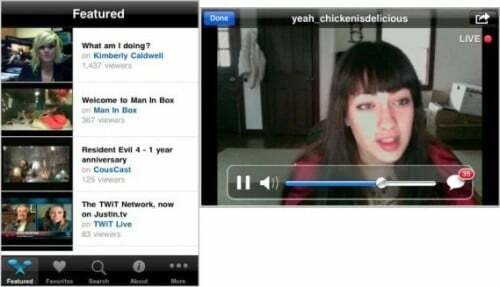 If you know of any more apps to watch or stream live TV to an iPhone, post it in the comments! Enjoy!